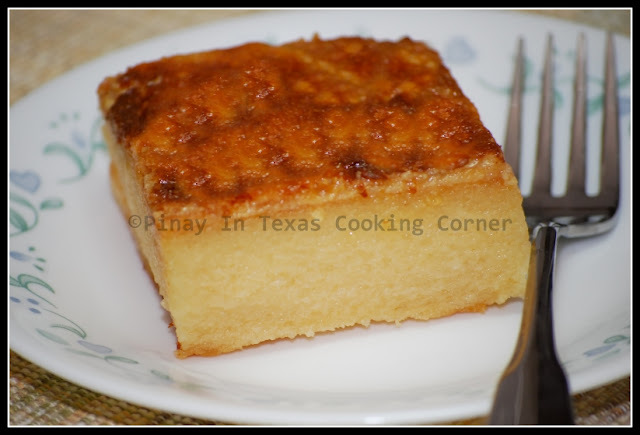 Cassava cake is another all-time favorite dessert in the Philippines. It is made from grated cassava which Filipinos call kamoteng kahoy or balanghoy. Desserts made from cassava are very popular because cassava is easily grown anywhere in the country. Cassava cake is so popular that there are a lot of different versions available. Check out mine! * I shared this on Miz Helen's Country Cottage's Full Plate Thursday, It's a Keeper Thursday, and Sweet Tooth Friday. Hi, thanks for stopping by my blog! Your cassava cake looks beautiful! I have never made such a cake, but seeing yours makes me want to go to the kitchen and create! I teach a book in my class in which cassava plays a big role. I woudl love to make this for thekids next year. Bookmarking your recipe to add to my lesson plan! @ Katerina, Jenny & Lynn: Tnx for dropping by! It looks so moist and yummy!I'll have to try it, thanks for sharing! Is this cake sweet! It looks like a baked custard consistency! Looks really creamy and lovely.Thanks for sharing! Linking up from Sweet Tooth Friday. Sai sono brasiliana e mi piaccia tutto che si fa con manioca,pero abito qua in Italia e qua è molto dificile di si trovare la manioca. E questa ricetta me ha fatto ricordare dal mio paesi. Here's how google translated your comment: "You know I am Brazilian and I like everything that is done with cassava, but I liveshere in Italy and here, it is very difficult to find manioc. It made me remember this recipe from my country. What a great cake, I just know it would be delicious. I would like to try it soon. Thank you so much for sharing at Full Plate Thursday and please come back! Oh my gosh thanks for the recipe! Now I just have to find Cassava in Tucson! I'm sure it's at a local Asian food store. My mother in law in Filipino and makes this for her son all the time! That's how it is. It gets hard when it's cold...but you can just heat it up in the microwave. Put it on a plate, cover with a wet paper towel and heat up for 30-45 seconds, and it will be good to eat. Hi tina, please help me. I have fresh cassava here, and im confused if i should boil it first and peel of its skin then grate it. Or should i just skip the boiling and peel of the skin then grate it...or should ijust grate it without removing the skin? Thanks so much! Hi! Just peel the skin off and grate the cassava without cooking. That's about the same way that my wife makes the cake. But, we use fresh cassava, and it's my job to skin it & grate it as well. I love the stuff & we always have most of the ingredients in stock. All, I have to get is the cassava. Hello - I just found your recipe and it looks wonderful. I'm making my first Cassava Cake for my sister in law for her birthday tomorrow. Can you please tell me what kind of cheese is usually used for the top? Thank you and thanks for the great recipe! grated mild cheddar cheese, Jenna. 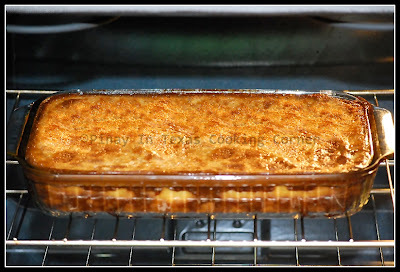 Just sprinkle about 1/4 cup of it on top of the cassava cake immediately after removing it from the oven. what exactly do you mean by bumpy and bloated? it's like there's air inside and i have to make a hole to let the air out and when it's already cooled, the surface is uneven. The topping will bubble up while baking, and that's normal. Just let it be. Don't poke the bubbles. The top can be bumpy that's why others usually sprinkle cheese on it to cover that. 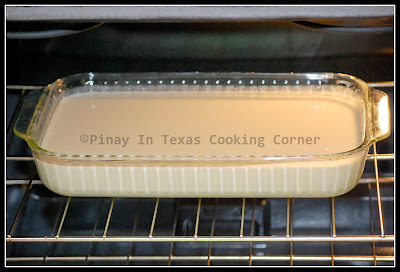 Good Morning Tina I am baking the cassava cake right now. I can't wait to try it I know it yummy tummy..
Have you tried ube macapuno cassava cake? A friend of mine made it with 1 pack each of grated cassava and grated ube then the macapuno is mixed in with the cake. Soooooo delicious! I've never tried making it. Yours look delicious! Haven't tried that...sounds really good! Hi! Tina, Today was the first time that I made cassava cake. I tried making your Cassava cake recipe and it was such a huge hit. It tasted just right! I couldn't believe that I was the one who baked it. Thank you! God bless you! Hi tina what is the equivalent measurement of the condensed milk in cups when your recipe says 1 1/2 14oz. Also what size egg (in grams) do you use? Also for the cassava cake do you need to put unsalted butter as well? I really don't measure it. :) Just divide 1 can into two. 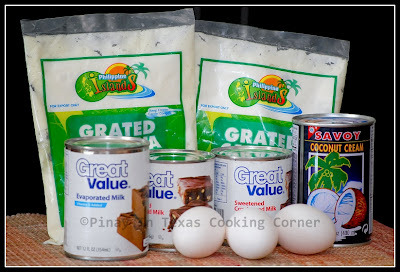 Use half for topping and the other half with the other can for the cassava cake. I don't use butter for my cassava cake. If you want, you can use butter to grease the baking dish/pan. Thanks for sharing this recipe tina, actually, I am trying it now and can't wait to make it over. Hi tina, wanted to try your casava cake recipe but i could'nt find grated casava in asian store here in Finland, can i use casava powder? I'm sure it will work but will give you a different texture. Can't help you with the measurements though coz I honestly haven't tried using cassava powder in making cassava cake. I already tried some of your recipes and we loved it. Easy for beginners like me :) thank you so much God Bless! Thank you Tina. Great recipe. My kids love it!